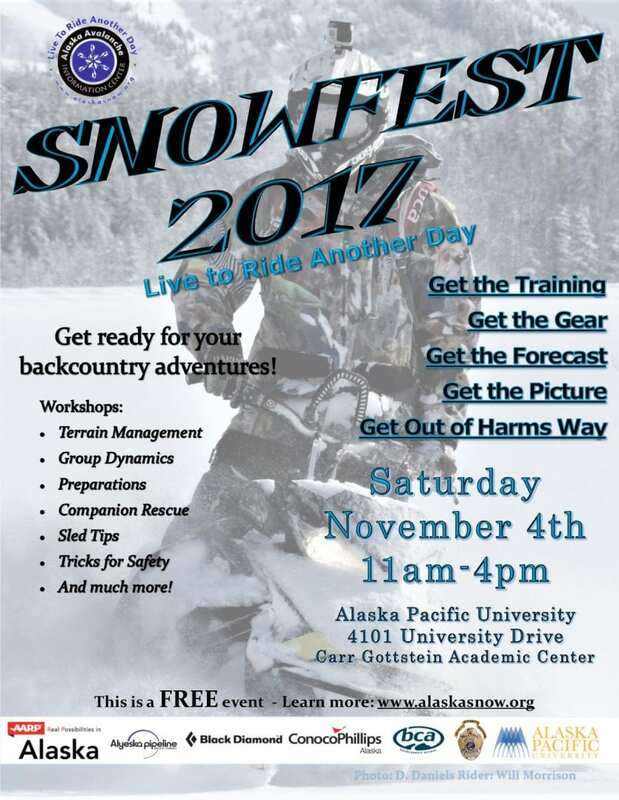 THANK YOU to everyone who taught, volunteered, participated, attended, sponsored… We had more than 70 people attend this year and offered lots of great training opportunities from Snowmobile Tips and Tricks, to basic backcountry travel techniques to equipment practice. If you attended but did not get the chance to share your feedback, please take a moment to do so now and you’ll be entered to win Black Diamond avalanche gear. Share your thoughts here! Invited guests include: Media, Communication Specialists, State and Federal Agencies who gather, use or need snow advisory information, snow practitioners, guides, policy makers and community leaders. Space is limited Reserve your seat today. View the Agenda Here. The public is invited to join AAIC on Saturday, November 4th 11 am and 2 pm at the Alaska Pacific University for free safety workshops courtesy of AARP Alaska and the Alaska Department of Public Safety, Division Alaska State Troopers.